September 6, 2017 at 12:00a.m. Where: 23 Chestnut Ave., Sharon, Pa. Hours: Tue.-Thu. : 11 a.m. to 10 p.m.; Fri.-Sat. : 11 a.m. to midnight; Sun. : 11 a.m. to 7 p.m. Available for purchase: Flights, pints, growlers, handcrafted sandwiches and burgers. Craft-beer lovers in the region have what feels like a seemingly endless list of new locations at which to partake. 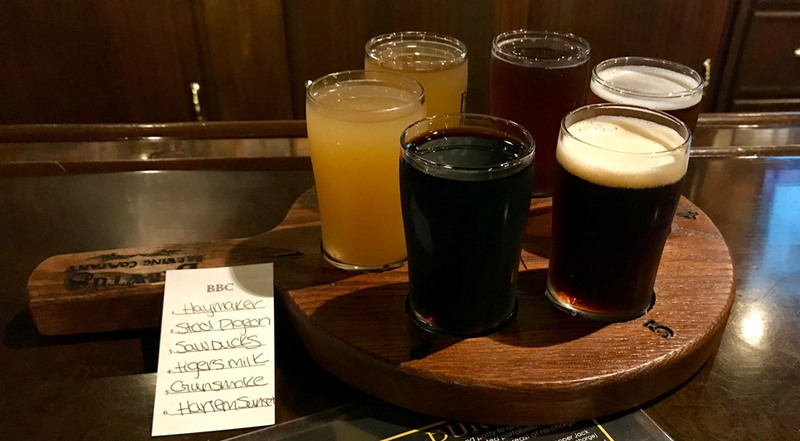 One terrific place to have a quality cold one is Brewtus Brewing Co. in Sharon, Pa., an early arriver in this wave of regional brewery activity. After last week’s mission, Mahoning Valley Flight Crew members were pleased with what was discovered after touching down at Brewtus. When you walk inside, you get the vibe of a true Prohibition-era saloon. Many of Brewtus’ beers are even named after slang terms from the era – Gunsmoked, Sawbucks and Stool Pigeon, to name a few. Co-owner Jason Camerlengo and his staff, Samantha Fetterman and Zoe Roman, took great care of the crew – from arrival through departure. From flights of beers to delicious burgers (such as the Hangover and the Brew Burger) to a tour of brewery operations, we were never left wanting more. Brewtus operates a seven-barrel brewing system, and will have served about 30 different beers by the end of 2017. Seven Brewtus brews and a handful of guest beers and ciders were on tap. Jason and his uncle, John LaRocca, opened the brewery in 2015, but the Brewtus name has existed since 2012 (it stems from a Brutus-10-style brewing system instrumental in the decision to open the brewery). Camerlengo began brewing on his stovetop in 2005 as a “poor college student” with a love of quality craft beer. After teaming up with LaRocca and brewing dozens of styles of beers, both knew it was time to go into business. Camerlengo says it’s the quality of beers and the variety of food options that make Brewtus stand out. There are expansion plans, but slow and steady growth is on his mind. The Mahoning Valley Flight Crew is focused on the here and now. So, here’s our nickel on the craft beers that were served up. “Scottish brewing methods are said to go back some 400 years. Brewtus Brewing Co. has a nice Scottish ale in its craft beer offering called Sawbucks, which as we learned, was a Prohibition slang term for a $10 bill. And while a pint of this won’t cost you anywhere near $10, this beer does carry many of the true characteristics of its Scottish Ale ancestry. I found this beer to be a medium-bodied amber ale, which poured clear with a malty profile. Sawbucks was also easy to drink. It had, by far, the lowest ABV content of any of the beers we sampled at 3.5%, a bonus for lovers of Scottish ales. The Flight Crew’s advice: Get over to Brewtus to try outstanding beers and great food. If you’re patient, you might just run into some great seasonals such as Heebie Jeebies Pumpkin Spice Ale or Blitzen Christmas Ale. July 18, 2018 12:05 a.m.